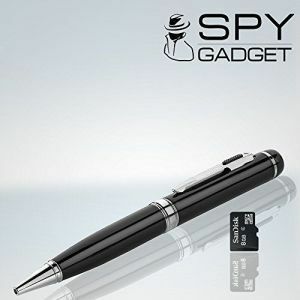 ncluded: Spy Pen Camera, USB Cable, 8GB SD Card, Instructions, Box Video Format: 40 FPS AVI Video Resolution: 1280 x 720P HD Photo Resolution: 2560 x 1440 Sound Recording: 24kHz System: PC/Mac Other Features: Webcam, DVR, Timestamping. Go be a super top secret spy! Only buy from Spy Gadget!